Are you familiar with any strategies for locating main ideas in a reading passage? If you need to learn these strategies, refer to another series of activities entitled ‘Learn how to locate the main ideas in a text’. Read the nine different sections of the article below about Japan and blood types. Choose the main idea from each section and then check your answer before you go onto the next section. Blood is one thing that unites the entire human race, but most of us don't think about our blood group much, unless we need a transfusion. In Japan, however, blood type has big implications for life, work and love. Here, a person's blood type is popularly believed to determine temperament and personality. "What's your blood type?" is often a key question in everything from matchmaking to job applications. 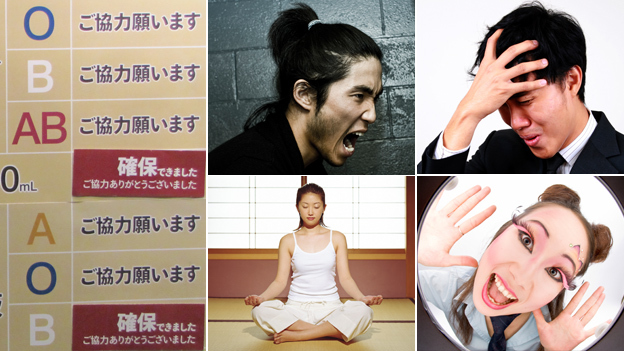 According to popular belief in Japan, type As are sensitive perfectionists and good team players, but over-anxious. Type Os are curious and generous but stubborn. ABs are arty but mysterious and unpredictable, and type Bs are cheerful but eccentric, individualistic and selfish. About 40% of the Japanese population is type A and 30% are type O, whilst only 20% are type B, with AB accounting for the remaining 10%. Blood is something that unites humanity. Many Japanese believe a person’s character is determined by their blood type. The Japanese population can be divided into four groups according to their blood type. The answer is B. C) is true of any nationality, not just the Japanese. A) is simply a scientific truth and not a main idea here. What follows is very unscientific. Four books describing the different blood groups characteristics became a huge publishing sensation, selling more than five million copies. Morning television shows, newspapers and magazines often publish blood type horoscopes and discuss relationship compatibility. Many dating agencies cater to blood types, and popular anime (animations), manga (comics) and video games often mention a character's blood type. A whole industry of customised products has also sprung up, with soft drinks, chewing gum, bath salts and even condoms catering for different blood groups on sale. Beliefs about blood typing have become popular in Japan through the publication of four best-selling books. The issue of blood group characteristics is becoming more well-known in Japan. Blood typing is helping companies sell more products in Japan. The answer is B. Answers A) and C) are too narrow. Different proteins in your blood determine your blood type. Blood typing is a cause of discrimination in Japanese society. Beliefs about blood type characteristics are popular because the Japanese enjoy finding little differences in people. The answer is C. A) is not correct, because the paragraph is not about proteins in the blood. B) is not correct, because this idea is only referred to in the last sentence. It was 1901 that the ABO blood group system was discovered by the Austrian scientist Karl Landsteiner. His Nobel prize-winning work made it possible to identify the different blood groups, paving the way for transfusions to be carried out safely. Theorists of eugenics later hijacked his research during the inter-war years, with the Nazis using his work to further their ideas of racial supremacy. It was also adopted by Japan's militarist government in the 1930s to train better soldiers, and during World War II; the Imperial Army is reported to have formed battle groups according to blood type. Blood typing has been used to benefit humanity, but has also been used for evil purposes. Blood typing has made blood transfusions possible for over a century. Blood typing has been used to enhance the strength of the military. The answer is A. Although B) and C) are both true and equally important ideas in the paragraph, the answer should include all the ideas in the paragraph. The study of blood types in Japan gained mass appeal with the publication of a book in the 1970s by Masahiko Nomi, who had no medical background. More recently, his son Toshitaka went on to promote it further through a series of popular books - he also runs the Institute of Blood Type Humanics. He says his aim is not to judge or stereotype people, but simply to make the best of someone's talents and improve human relationships. Between them, father and son have published dozens of books on the subject, not just the handful of bestsellers. Despite Masahiko Nomi’s lack of a medical background, he managed to popularise beliefs about blood group characteristics in Japan. Learning about blood types helps people enhance their relationships and talents. Books written by a father and son have made beliefs about blood group characteristics popular in Japan. The answer is C. Books are mentioned four times in this paragraph, so it is obviously a key idea. These beliefs have been used in unusual ways. The women's softball team that won gold for Japan at the Beijing Olympics is reported to have used blood type theories to customise training for each player. Some kindergartens have even adopted methods of teaching along blood group lines, and even major companies reportedly make decisions about assignments based on employees' blood types. In 1990 the Asahi Daily newspaper reported that Mitsubishi Electronics had announced the creation of a team composed entirely of AB workers, thanks to "their ability to make plans". These beliefs even affect politics. One former prime minister considered it important enough to reveal in his official profile that he's a type A, whilst his opposition rival was type B. Last year a minister, Ryu Matsumoto, was forced to resign after only a week in office, when a bad-tempered encounter with local officials was televised. In his resignation speech he blamed his failings on the fact that he was blood type B. Blood type theories have been used in particular to enhance teaching and training. Type A people make better politicians. Blood type theories have had an unusual effect on different areas of life. The answer is C. A) is too narrow. It ignores the information given about the former prime minister. B) is not correct because the information about the prime minister is just one of the unusual effects of beliefs about blood typing. Not everyone sees the blood type craze as simply harmless fun. It sometimes manifests itself as prejudice and discrimination, and it seems this is so common; the Japanese now have a term for it - bura-hara, meaning blood-type harassment. There are reports of discrimination against type B and AB groups leading to children being bullied, the ending of happy relationships, and loss of job opportunities. Despite repeated warnings, many employers continue to ask blood types at job interviews, says Terumitsu Maekawa, professor of comparative religion at Tokyo's Asia University and author of several books about blood groups. He's critical about sweeping popular beliefs about blood types. "We can point out some general tendencies as a group, but you can't say this person is good or bad because of their blood type." Discrimination is common in Japan.. Blood typing is used in Japan to discriminate against particular people. Employers have been warned not to use blood typing as a means to screen (evaluate) job applicants. The answer is B. A) is incorrect because it is too broad and C) is too narrow. Maekawa’s own research, he says, is based more on empirical research rather than popular superstition. In his books he explores the theory that predominant blood types may determine religious beliefs and societal norms. In the Western world, O and A types make up almost 85% of people, but in India and Asia, B types predominate. Japan, he says, is unusual in Asia in that it has more variety of blood types. "A type societies tend to be characterised by monotheism such as Christianity and Judaism, with one fundamental analysis of human beings and a strong sense of societal norms. But societies dominated by B types are more prone to polytheism - like Buddhism and Hinduism - with lots of gods, and they think people are all different." Your blood type may determine whether you believe in one god or many gods. Japan is quite different from most other countries because it has a wider variety of blood types. Predominant blood types may determine a country’s religion and modes of behaviour. The answer is C. A) is not true. The society to which one belongs would determine this more. B) is true, but this is not what the paragraph is about. Professor Maekawa, himself type B, says in Japan his blood group is often criticised for being too individualistic and selfish. "It isn't very nice. But it doesn't annoy me or hurt me, because it has no scientific basis at all." In a smart state-of-the-art clinic busy with lots of people donating blood, director Akishko Akano says he's not aware that the negative image of certain blood types has an impact on their work, or dissuades minority B and AB types from coming forward. A bigger problem in Japan's rapidly ageing society, he says, is persuading enough young people to volunteer as blood donors. In the next room, I find Masako, lying on a bed strapped to a quietly purring machine as a nurse takes samples. This is the eighth time she's given blood. Her blood type is AB, which is rare as it accounts for only 10% of people in Japan. "People sometimes don't like me," she tells me. "They think I am weird and strange. Lots of people tell me they don't understand what I am thinking about." Although Masako laughs as she tells me this, it seems that in Japan, no amount of scientific debunking can kill the widely held notion that blood tells all. Personal characteristics arising from one’s blood group has no scientific basis. Discrimination involving blood typing does not affect the willingness of volunteers to give blood. Japanese people’s belief in the link between blood type and personality is widespread despite criticism from scientists. The answer is C. This final paragraph is not about the lack of scientific evidence in blood group characteristics, so A) is not the correct answer. B) is true, but not the key idea here. The final sentence is both a conclusion for the paragraph and a conclusion for the whole article.